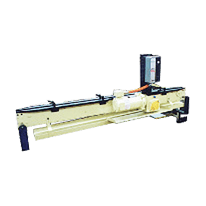 Model 1650 Thru-Feed Conveyors — Feedall conveyors offer entrance, intermediate and exit capabilities for a wide variety of machine tools and processes including centerless grinding, thread rolling, belt finishing, heat treating and assembly. Special design considerations allow these conveyors to operate in harsh environments (oily, chips, grinder swarf, etc.). Polyurethane timing belts are used for non-marring applications. Conveys parts to the workrest of a Cincinnati Centerless Grinder. Conveys steel bushings from an Acme Centerless Wire Brush to End Finisher. Conveys pinion shafts to the workrest of a Cincinnati Model 325 Centerless Grinder. Conveys carbide blanks between the workrest of two Cincinnati 320-12 Centerless Grinders. Conveys shafts to the workrest of a LANDIS Centerless Grinder.